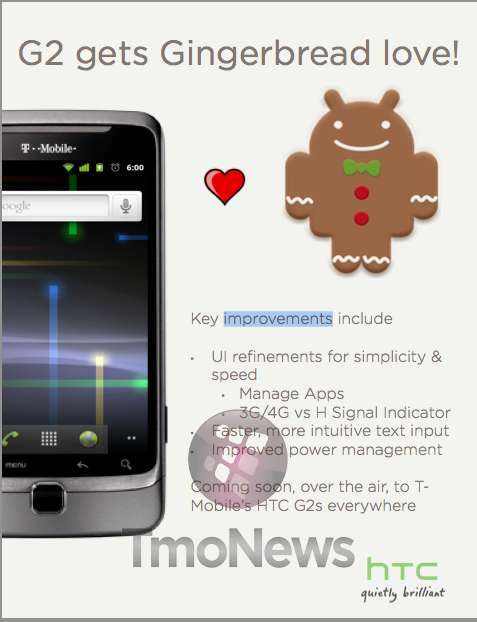 There has been plenty of talk about the T-Mobile G2 receiving Gingerbread, most of it unofficial. Early April saw a report courtesy of ComputerWorld that the G2 would definitely receive Gingerbread sometime over the “Summer.” Well we just received a ninja shot of a flyer being sent out to T-Mobile employees indicating that the G2 is absolutely positively receiving Gingerbread and this will certainly put to rest any argument saying otherwise. We’re trying to find out what “Coming Soon” means in HTC and T-Mobile speak, but at the very least G2 owners can sit back and relax in the knowledge they will be receiving Gingerbread is on its way. Heck ya! :D i have a G2 and the small but useable improvements will be nice. Cant wait. Very nice!!!! I may have to unroot my wife’s G2 and put official gingerbread on her phone… she doesn’t use any of the “extra” perks in CM so why bother. Nice for my G2, I have a G2x but I will put this official update on my G2 and sell it. It is really a superb device, it does not get enough credit, I would still pick it over the sidekick despite the 14.4 modem. I have the G2 and the Sidekick (I love hardware keyboards) and I must disagree with you. The sidekick is an amazing piece of hardware. The keyboard alone kills the G2, the hinge is a million times better, hspa 21 vs 14.4 on the G2, a front facing camera, lower price, and even the 3MP camera takes better pictures than the G2’s 5MP one. I wonder how many of these UI improvements I’ll notice since I use LauncherPro for my UI. Actually, it will be nice to tell if I’m getting 3G vs 4G. That H doesn’t help much. I prefer seeing the “H” to seeing “slow”, I mean “edge”. Also, it would be interesting to see how much better Gingerbread’s power management is. I’m just excited about that cathode TV shut-off thing. Pretty sassy. All right! I love my G2 so anything that will make it better is exciting. After seeing what 2.2 did to my Vibrant and what 3.1 did to my iPhone 3g I’m not updating ever again! LOL!! I’m currently running a test version and I have to say that the most improved aspect of the phone is the battery life. I’m now getting close to twice the battery life as before! If ur telling the truth, you made my day! HAHAHAH, Ive been running Gingerbread on my G2 for the last 3 months. Its called Rooting your phone, and it is soooo easy on the G2! Quit slacking and root your phones people. I get 3 times the battery most of my friends do, and I have my phone overclocked. Im running Cyanogen, on this thing and its amazing. Wi-Fi Calling has been working for months, GPS issues have been resolved, and speed and battery life has no comparison vs the last OTA that Tmo put out. Quite frankly, The G2 is an amazing phone. The only real flaw was/is the hinge. I got mine back in Oct-10, and never really got a good hinge. I don’t know if that has been resolved on the new versions of if people just simply got used to it. I would have preferred a slider over the z-hinge. No I’m just waiting for the Sensation or something like it with keyboard. I’ve never been a fan of sidekick. Look at the upcoming myTouch 4G Side 2 words Duel Core. Just stick to stable releases, and you will be A.O.K. this great news but is this a one shot deal like the g1 android and 1.6? I could wait no longer. Therefore I rooted and flashed the latest cyanogen stable ROM. I was hesitant at first but everything went smooth and Gingerbread is a wonderful welcome. The visionary method is very simple along with clock work (free clockwork is all that is needed). Well if this is true then they finally honored their commitment to keep the G series yup to date. Hopefully, this will negate the weekly (at least) battery pull when the phone dies for no apparent reason. Would love to root but a company phone and they dont allow modified phones on the network. I had that problem as well, i think it was a bad shipment of phones. Got a new one from t-mob and that hasnt happened again to me. We’ll get it at some point. Maybe nothing to do with this sketchy looking flyer though. I’m on day 2 with my G2x. So far, so good – but will it hold out in that state until Gingerbread? Man, I hope so! If I start having anything even hinting at WiFi issues before my 30 days are up, back it goes to RadioShack.